Joseph Ettedgui founded his Joseph boutique chain in London in 1977. His retailing skills enabled him to build up a group of shops which bring together a selection of innovative contemporary designer fashions alongside his own self-named lines. 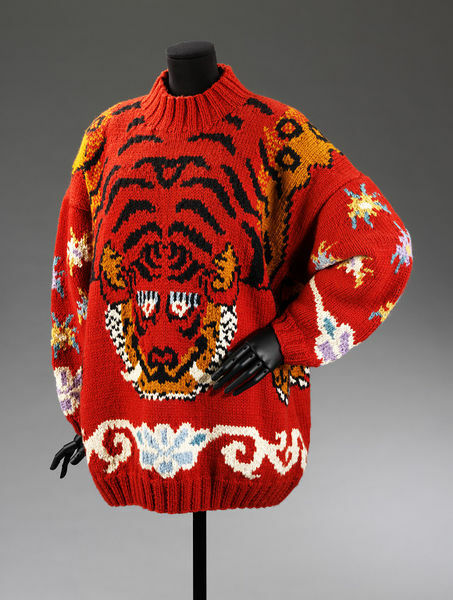 He created the Joseph Tricot knitwear label as one of several of his own clothing lines. Aimed at a sophisticated clientele, the Tricot line offers wool knits, jumpers and cardigans for both men and women. This vibrant red jumper with prominent tiger motif is an typical example of the 1980s taste for heavy, strikingly patterned knitwear. 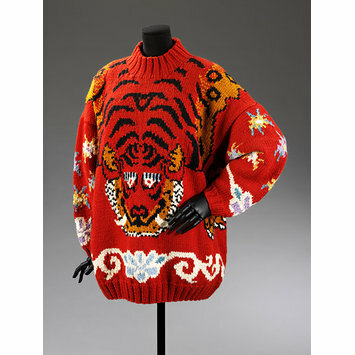 Man's fully fashioned wool jumper of red yarn depicting tiger. The tiger's full body is depicted on both the front and back continuing over the neck. The hem and sleeves are edged with flowers.